Author American Business AdvisorsPosted on November 28, 2017 Leave a comment on Season’s greetings to you this holiday season! What can rapidly diminish the value of any trust built is that denominator of “perceived self-interest.” The stronger the sum total of the messages we send to our employees and stake-holders that what we do is about us– about what’s in our self-interest– the weaker the trust. 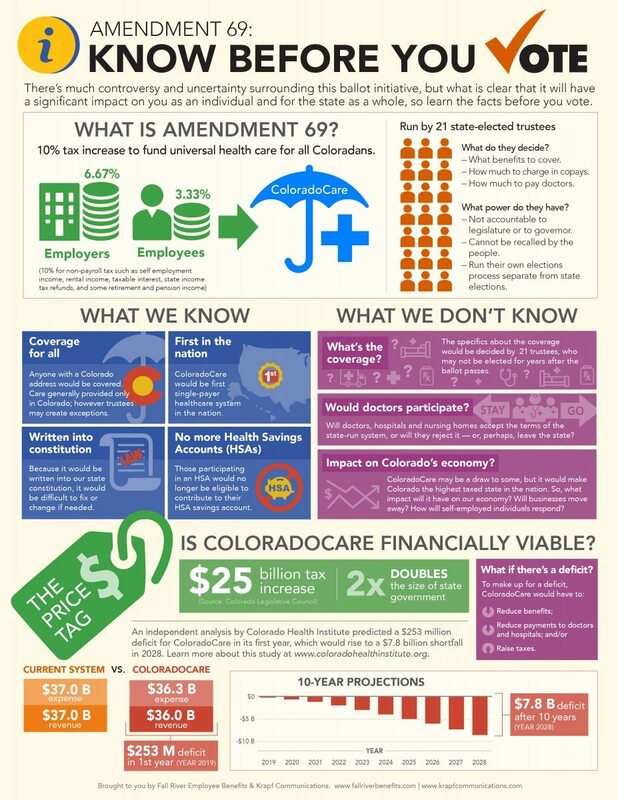 Let’s use the example of a Colorado ballot issue—Amendment 69– to illustrate how to tell your employees how to vote. 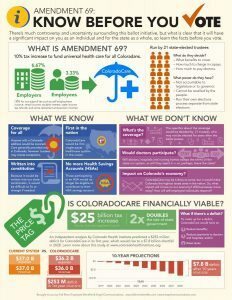 While I realize that there’s a lot of uncertainty regarding healthcare coverage by many Coloradans, this is absolutely not the answer. … This will result in $25 billion in unfunded liabilities in Colorado, and the people who will bear the brunt of this cost will be our employers, especially our sole proprietors, small-business owners and the generators of our economic growth. At a recent Colorado Financial Planners Association (COFPA) meeting, Sameer Somal, Blue Ocean founder, gave a sobering snapshot of things every financial advisor needs to consider: what’s next for your practice. When an industry like financial planning is undergoing rapid tectonic plate shifts, the impact of those shifts create a tsunami of change to every participant in the industry—not only advisors–especially their clients. I had a BFO last Wednesday. Facilitating the TiE Rockies Entrepreneurial Roundtable (click for upcoming offerings), I discovered firsthand why a Crankset Group tool–the Bottleneck Exercise–works so effectively to highlight a business owner’s blind spot and allow us to truly take the next step. Author American Business AdvisorsPosted on November 23, 2017 Leave a comment on Why You also Need a Client Happiness Specialist! “I have been crucified with Christ (when he died for my sins at the cross) and I no longer live, but Christ lives in me. The life I live in the body (my physical body with a sinful nature), I live by faith in the Son of God, who loved me and gave himself for me. I do not set aside the grace of God, for if righteousness could be gained through the law, Christ died for nothing!” (Galatians 2:20-21). The Bible has much to say about how to establish and maintain such a relationship with God, including the benefits of the relationship. When a person puts their belief in Jesus Christ that person is “born” into God’s family and at that time their personal relationship with God begins: “Yet to all who received him (Christ), to those who believe in his name, he gave the right to become children of God – children born not of natural descent, nor of human decision or a husband’s will, but born of God” (John 1:12). That is, your spirit is given life as was intended from the beginning of creation and God lives in you (your spirit) for eternity (forever, regardless of what kind of physical body your spirit lives in)! “Jesus answered, ‘I am telling you the truth: no one can see the Kingdom of God without being born again.’ ‘How can a grown man be born again?’ Nicodemus asked. ‘He certainly cannot enter his mother’s womb and be born a second time!’ ‘I am telling you the truth,’ replied Jesus, ‘that no one can enter the Kingdom of God without being born of water and the Spirit. A person is born physically of human parents, but is born spiritually of the Spirit. Do not be surprised because I tell you that you must all be born again. The wind blows wherever it wishes; you hear the sound it makes, but you do not know where it comes from or where it is going. It is like that with everyone who is born of the Spirit’” (John 3:3-8 GNT). “For God so loved the world that he gave his one and only Son, that whoever believes in him shall not perish but have eternal life. For God did not send his Son into the world to condemn the world, but to save the world through him. Whoever believes in him is not condemned, but whoever does not believe stands condemned already because he has not believed in the name of God’s one and only Son. This is the verdict: Light has come into the world, but men loved darkness instead of light because their deeds were evil. Everyone who does evil hates the light, and will not come into the light for fear that his deeds will be exposed. But whoever lives by the truth comes into the light, so that it may be seen plainly that what he has done has been done through God” (John 3:16-21). American Business Advisors (ABA) is the leading business consulting firm specializing in Building Cash Cows® and Improving Quality of Life® services for mid-size and small companies, family businesses, and their owners. Established in 1984, we were one of the first firms in Denver to offer both management consulting and strategic consulting, and we now offer these services to mid-size and small businesses across America.